Both words mean "Grave" or "Burying Place". They never mean "the cessation of being". They never refer to "suffering". These words should not be translated as "hell". They are words which refer to the actual location of physically dead bodies. In QEBER / MNEMION "the dead know nothing". In this place all the dead are "sleeping" in the dust of the earth. "Unto dust thou shalt return" (Gen. 3:19). Always a burial site, a specific location. Both words always mean "The Realm of The Unseen Dead". These words never refer to "The common grave of mankind", as the Jehovah's Witnesses falsely teach (See Reasoning's From The Scriptures, Watchtower Society, 1985 page 169). These words always indicate "a dwelling place for departed souls", as any reputable lexicon will show. All the dead in Sheol or Hades, are conscious, and are either in the "paradise" of "happiness and blessedness", or they are in the "torments" of "pain and suffering". Nobody in Sheol or Hades is unconscious, or annihilated. This is one of the compartments of Hades/Sheol. This is also called Abraham's Bosom". It is a middle eastern word indicating the courtyard of a palace, the inner gated entryway. It is one of the precincts of heaven. Jesus told the believing thief that he would be there with Christ himself. It is a temporary holding place for disembodied souls awaiting the resurrection of their bodies. It is a place of heavenly bliss and rest. But it is not the final abode of believers. This compartment of Hades / Sheol is across the Great gulf that separates Paradise from the Torments. No one can traverse "the great gulf" from one side to the other. The people in Paradise are not in "torments" and the people in "Torments" are not in paradise, but both are in Hades / Sheol (the abode of the unseen dead). All three of these Greek words mean "Pain", "Torture", "Extreme Suffering", "Torment". No amount of doctrinal or textual twisting can remove the suffering of this place. "Consciousness" is required for such suffering to occur. Nobody here is unconscious or annihilated. This always means conscious torment (Look up and compare Lk. 8:28; Lk.16:28; Rev. 9:5; Rev. 11:10; Rev. 14: 10,15; Rev. 20:10). This is not Sheol, Hades or Torments. It is the place which the Bible calls "the blackness of darkness". It is also called "the bottomless pit", and it is the place where fallen angels are reserved unto judgment (Jude 13). In Tartarus they are bound with 'chains of everlasting darkness". Tartarus is the compartment of Hades which is reserved for "the angels which kept not their first estate (Jude 6). This is the time when God will call all the dead out from their graves, and reunite their body with their soul. It is a single event, at the end of time, when everyone, small or great, will stand before God and be judged (Matt. 25:31-46). It is a contiguous event with the second coming of Christ. When He returns, the dead will be raised, the judgment day will occur, the heavens and the earth will pass away, and God will create a new heaven and a new earth. The resurrection is an event in which all people will participate (Acts 24:14), some will be resurrected to the resurrection of life, and some to the resurrection of eternal damnation (Jn. 5:29). For believers who are alive at the Second Coming of Christ, the event is called "the rapture", because they will be caught up into the air, and will be changed in "the twinkling of an eye". The Bible is clear that everyone will one day stand before God, and the books will be opened, and everyone will be judged, not just for their deeds, but for whether or not they have trusted in Christ alone for salvation. People whose names are written in the Lamb's book of life, will enter heaven itself following the judgment. Both words mean "The Eternal Fire", "The Everlasting Burnings". These are the only words which should actually be translated as "Hell". They mean "Eternal Separation From God". This is "the Lake of Fire", and it is the Eternal penitentiary of the doomed and the damned, for all the ceaseless ages of Eternity. This means "Eternal Separation" from God, and "Eternal Punishment" under the justice of His Divine and Holy wrath. "The vessels of wrath, fitted for destruction" (Rom.9:22), "The tares" (Matt. 13:25-40), "The unbelievers" (rev. 21:8), and "the Devil and his angels" (Matt. 25:41) will all be cast there where they will suffer forever. This map was first conceived in 1996 when I published an early version of it under the name "The Bible doctrine of Hell". It was included in "The Jehovah's Witnesses Power Pack", and was intended to confront the false doctrines which the Jehovah's Witnesses promulgate concerning hell. This material has not been available for over 13 years, so I decided to recreate the chart, update it, and make it more widely available, in the form you see here. This map of "the compartments of Hades", is meant only to be suggestive. I was limited by the program which I used to make it, so that I could not represent everything exactly the way I had wished to represent it, especially when it came to diagramming item #6 "The resurrection". I would have liked to have made it more detailed showing how soul and body are reunited to stand before God . I did the best I could with the arrows, but it is not precisely what I wanted. You will see two yellow arrows going from Hades / Sheol (#2) to Paradise (#3) and Torments (#4). These are the two compartments of Hades where the dead await the resurrection. They are separated by a "great gulf fixed". This gulf, and Tartarus compose the other two compartments of Hades. The "Temporary flames" will give way to the "Permanent Eternal flames". 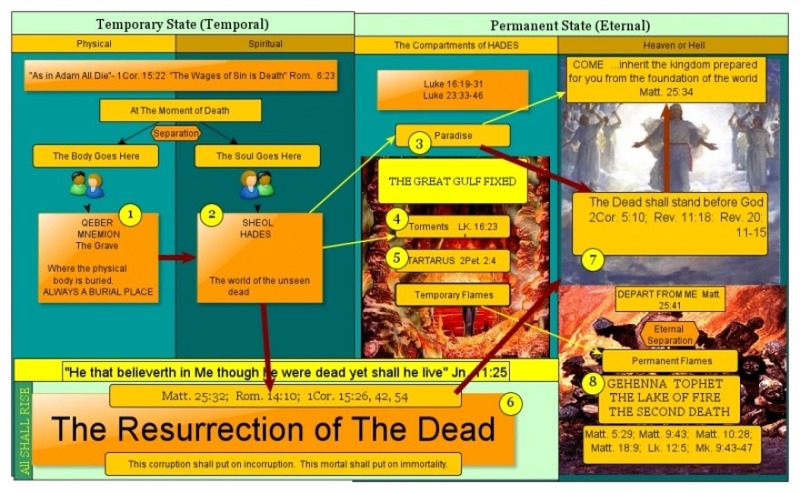 The reddish colored bolder arrows in the chart trace the idea of resurrection. The body comes out of the grave and is reunited with the soul in the resurrection and the person stands before God to be judged and either sentenced to hell, or welcomed into heaven. Please vote for this chart. Your opinion helps us design new and better materials. Thank you.